Our school opens at 7:30 a.m. and closes at 5:30 p.m. with instructional times from 8:30 a.m. to 3:00 p.m. Should your child be hesitant to leave you when taking him/her to the classroom, you may come into the room with him/her for five minutes, and only if you feel it necessary. 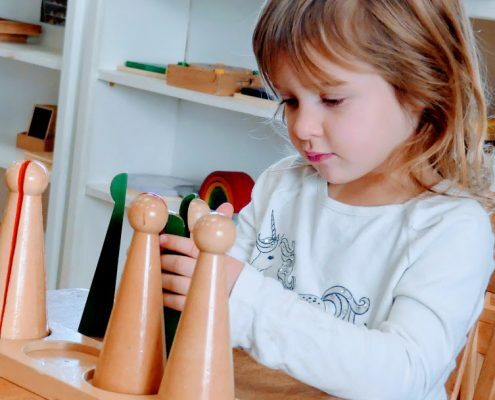 Almost always a child will transition within minutes after a parent has left when s/he becomes involved with the interesting activities in the school. If your child continues crying more than 15 minutes after you have left, we will call to inform you. Play clothes are encouraged – simple, washable, sturdy, and easy to manage. When selecting slacks for children, check to see if the child can fasten and unfasten them without help. Overalls are not recommended. Children should always try the zipper or buttons on a coat. Some zippers and buttons are frustrating for the children and are difficult for even an adult to manage. Please do not send your child to school with a coat that has a broken zipper or missing buttons. Sneakers or rubber-soled shoes are recommended (snow boots for winter). Cowboy boots, tap shoes, and clogs are not allowed because they are dangerous and/or a deterrent to active participation in all aspects of school activity. 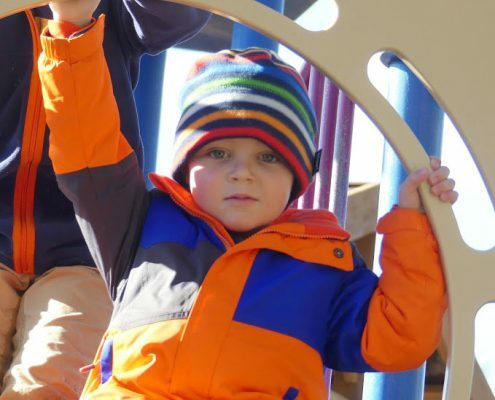 Parents must provide warm outer clothing for children to wear on the playground. Children may go outside for 20-30 minutes, if weather and temperatures are conducive. In the winter, children should wear long-sleeved shirts or sweaters to school as well as hats and mittens. The classroom temperature is usually kept around 70 degrees. Check your child’s extra clothing box each month to see if her/his clothes need to be replaced or a larger size needs to be brought to school. We recommend allowing your child to select his/her own garments to wear to school, within limits. This can best be done with parents the night before school. Please leave all toys, gadgets, stickers, fantasy books, workbooks, purses with makeup, felt pens, candy, gum, etc. at home. Parents are requested to notify Casa dei Bambini staff by 8:00 a.m. if your child will be absent. We do not have make-up days or refunds for illnesses or absences. We base our budget on the tuition from each student and need a guaranteed amount to meet our expenses. Individual conferences between parents and teachers will be scheduled at least once a year. There will be a sign up sheet for families in the Fall and Spring. 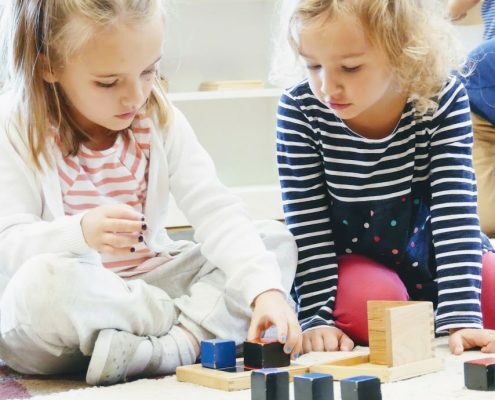 The purpose of each conference is to acquaint the parents with their child’s teacher and to promote dialogue between parents and teachers for the benefit of the child. Any additional conferences that the parent or teacher deems necessary may be made by appointment at any time through out the year. Please avoid questioning your child’s teacher about your child before or after class if in the presence of your child. At the beginning of class the teacher is obligated to focus attention on the children or to complete teacher preparation. Please feel free, however, to call and leave a message or to speak to the teachers after class about any helpful information you may have concerning your child’s health, attitudes, etc. Communication is encouraged, preferably during daytime hours. Please send your child with two healthy snacks as well as a lunch. Parents are encouraged to volunteer to bring snacks for all the children to enjoy. Snacks expose the children to interesting and appealing foods, especially those originating from a different country. Please let your child’s teacher know if you are interested in bringing a food item and remember to ask about any food allergies that the children may have. Most children also need to work with knives to develop their small muscles, concentration, and self-image. We recommend you send items such as fruit (bananas, apples, grapes), vegetables (carrots, celery, cucumbers), crackers, cheese, hard-boiled eggs, or muffins. Please do not send food containing sugars, food coloring, or an excess of salt or preservatives. If you have any questions about what type of snacks to send you may ask your child’s teacher for suggestions. GENERAL GUIDELINE: It is imperative that arrival and dismissal times be closely adhered to. The time before class is vital for teacher preparation to ensure a smooth and productive day. We ask that you arrive no earlier than five minutes before the start of class and pick up your children promptly at the conclusion of your program. Promptness in a child’s life is very important! Tardiness can be very disruptive. Children are not allowed to walk by themselves from the parking lot to the classroom. Parents must walk with their child to the door of the school where a teacher will greet each child. We ask that parents do not come into the classroom to talk to the teachers before class. After class, the teachers are usually available for questions. All special daily communications should be written down and given to the greeting teacher. Verbal communications are easily misunderstood or forgotten. You may also call and leave a message. We encourage parents to allow their child the opportunity to hang up his/her own coat and to walk into the classroom under his/her own power (not carried in). At arrival, please have your child walk (not run) to the door so that s/he is calm upon entering the classroom. And please, remember to take your child to the bathroom before class! At departure, parents must meet their child at the classroom door. No child will be allowed to walk alone to the parked car. NOTE: In the event, that your child(ren) will be picked up from school by someone other than your or your spouse, we require a written note when your child first arrives at school. The note should state the name and description of the person whom you desire to pick up your child. We will not allow any child to ride in a car with a person we do not know and whom we have not been notified of previously. If your child contracts a contagious illness (other than a cold), please inform Casa dei Bambini so that the other children’s parents may be advised. Children who have a fever of 100° or higher, earaches, vomiting, or diarrhea at school will be sent home. A child who has had any of these symptoms the previous day or night should not be brought to school. When recovering from a fever, vomiting or diarrhea, a child should be kept home for one full day after the symptoms subside. Doctors also advise us that it is safe for a child to return to school after chicken pox when all the pox have scabbed over. Please do not bring your child if s/he is feeling ill. We do go outside as often as possible and this type of playtime may only make your child feel worse or prolong their illness. Students will be provided with a school tote to facilitate in the “taking home” of completed works, lessons notes and/or other teacher/parent communications on a daily basis. Please bring the tote home each day and return it empty the next morning. The school will be using channel 9 WMUR’s television program/website as our primary source for announcements regarding school’s cancellations and delays. Children’s birthdays may be celebrated on the actual birth date or the closest school day to it. Parents may bring simple treats that are easy for 3 to 6 year-olds to manage. Beverages, ice cream, candy, and icing are not allowed. In helping to cultivate a spirit of giving among the children, we suggest that each child bring a small gift on his/her birthday to be given to the school for all the children to enjoy (an educational/non-fantasy book, rock artifact, item from another country…). Parents wishing to participate in this tradition should inscribe books with the child’s name and birth date and the number birthday the child is celebrating. If you are planning a home party for your child, please do not hand out invitations in school. Likewise, if your child is attending a party after school, please do not send gifts to school with your child. We feel that these situations can be upsetting for those who are not invited and can create hurt feelings and sad children. It would be more appropriate to mail invitations and plan weekend parties. Thanksgiving is a time when the value of thankfulness is brought to the children’s consciousness by helping them become aware of the needs of other people in the world and sharing from their own bountiful lives. They are encouraged to bring food for Thanksgiving baskets, which will be donated to local families in need. Please check your child’s pockets daily (and subtly) for unusual (hard-to-replace) items. Sometimes things disappear (i.e., puzzle pieces, beads, rocks, sound-bucket objects, number tiles, labels…). Never feel embarrassed about returning one of our odds and ends. The children are very honest. Sometimes they desire to take part of their school home with them.